After a short drive from Malaga airport, you'll find yourself in the cosmopolitan resort of Fuengirola, one of the most visited destinations in the Costa del Sol. Like many of the popular resorts in the region, Fuengirola began as a charming fishing village and soon began to attract visitors from far and wide because of its glorious beaches. Today, this thriving resort has retained much of its character whilst still managing to create an atmosphere of fun, excitement and sophistication for holidaymakers. If you’re looking for ideal holiday weather, mid-march to mid-June, and early October to late November are the best times to go. But, Costa Del Sol and Torremolinos offer around 300 to 320 guaranteed days of bright sunshine each year and the annual mean temperature is 18°C. In July-September, during the hottest months, peak temperatures reach the late-20s! The cooling breezes from the Mediterranean coast take the edge off high temperatures though, making even the hottest months perfect for a beach holiday. Attractions in Fuengirola are varied and appeal to a range of tourists with a variety of interests. Sould Park is a theme park, perfect for those on holiday with young children. The Costa Water Park - in inlatable playground in the shallow water - is another attraction for children (and adults!) who can’t keep still. For more adult attractions, the Rio Fuengirola Pedestrian Bridge is a fascinating landmark to see in Fuengirola. The structure of the bridge is remarkable and looks even more impressive when lit up at night. Bioparc Fuengirola is an excellent trip, with a focus on nature. See animals, not confined behind bars, but looked-after in a controlled, natural environment. There’s even a chance to see nocturnal animals during certain night entries to the park. 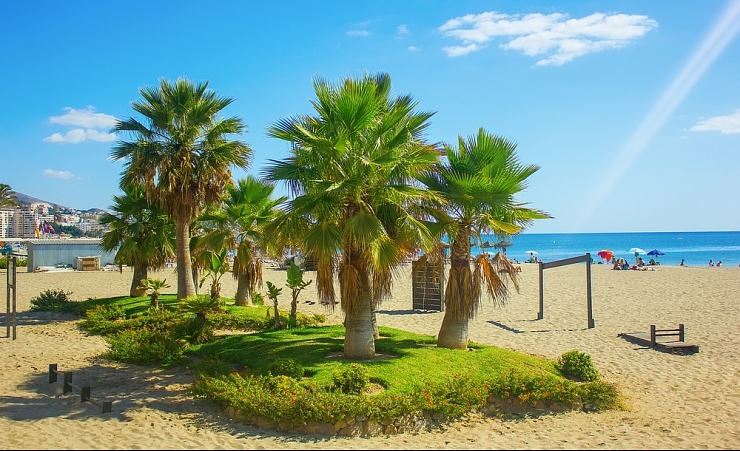 Fuengirola is home to over five miles of impressive beaches which means there'll be plenty of opportunities for you to find your own space in the sunshine to work on your important tan. Playa de Fuengirola is one of the main beaches in the area. Relax on the beach, participate (or watch) in watersports or walk along the Paseo Maritimo promenade during the summer months. Los Boliches is one of the most popular beach resorts in Fuengirola, with an adjacent strip of wooden decking to walk on, which is perfect when the sand is too hot. There are lots of opportunities to shop, dine and keep active here, too. Food plays a big part of any Costa del Sol holiday and travellers to Fuengirola won't be disappointed with the choices they'll find here. The vibrant town is full of excellent restaurants, trendy tapas bars and plenty of places to stop and enjoy a drink or a cocktail. Expect to try fried squid rings, sardines and other Spanish delicacies! La Plaza de los Chinorros is a tapas bar, often receiving glowing reviews about its tasty, authentic food. The Miramar Shopping Centre is a hot-spot for shopping. A large, busy shopping venue for those looking to take a few Spanish souvenirs home. If you enjoy a trip to the theatre of an evening, The Salon Varietes Theatre is an English-speaking theatre that offers premium entertainment. Other options include Spanish bars, like Bar Elements, as well as English-inspired pubs like The London Pub Fuengirola. Get a true taste of Costa Del Sol culture at the Fuengirola street market. You can also visit the Plaza de la Constitución, a simple shopping square where locals spend their afternoons and evenings. Sohail castle is a castle in Fuengirola which has been demolished and rebuilt several times. It makes for an interesting, historical excursion. From horse riding to golf, you'll find action, adventure and sports activities within easy reach in Fuengirola. If water sports are your thing, a spot of calming fishing is an option. If hop on a jet ski or speedboat for a high-speed thrill. Malaga is the closest airport to Fuengirola and is well-connected by a simple, great-value commuter train. Car rentals, taxis and buses are also available to use when travelling to Fuengirola. The best mode of transport in Fuengirola is walking as you’ll find most amenities for a holiday within walking distance. There is also a bus each way to Marbella and a water taxi to Benalmadena should you wish to visit other towns outside of Fuengirola. Costa Del Sol and Torremolinos offer around 300 to 320 guaranteed days of bright sunshine annually with a mean temperature of 18 degrees centigrade, and peak temperatures in high season (June to September) up in the late 20s centigrade. The cooling breezes on the Mediterranean coast take the edge of high temperatures, making for perfect family beach holiday resort conditions.